"Everyone in Trenton is aware of the tax problems that we have here & that the state's in a financial crisis. Our goal is to come up with a solution that's not all these taxes. I think that people that have the ability to leave are leaving." – NJ Senate President, Democrat Steve Sweeney speaking about the annual budget crisis that occurs every July 1 in NJ & specifically against NJ Governor Democrat Phil Murphy's proposed sales tax increase & imposition of a 19.8% tax boost to the highest marginal income tax rate in the state. Well Senator Sweeney is certainly right to be concerned – the above map of the U.S. shows that states depicted in yellow experienced the largest moving deficits according to United Van Lines 41st Annual National Movers Study, which tracks customers' state-to-state migration patterns over the past year. 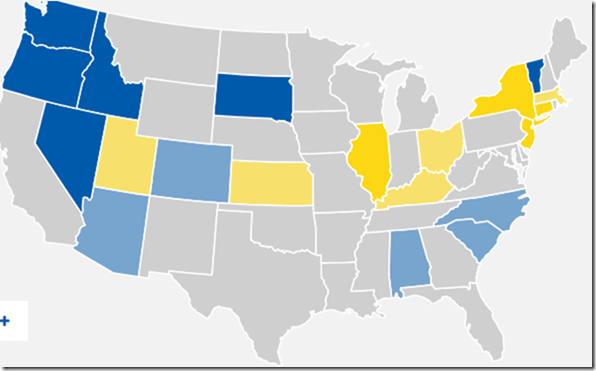 States depicted in dark blue had high inbound movements. In 2017 NJ led the way in this negative category in the Northeast with 63% outbound moves followed by NY (61%), Connecticut (57%), & Massachusetts (56%). Illinois is now in the top spot overall, also with 63%, inching out NJ by a decimal point. NJ had infamously held the top spot for the past five consecutive years. United Van Lines classifies states as "high outbound" or "high inbound" if 55% or more of the moves respectively are outbound or inbound. The 2017 data reflects the longer trend movement to the western & southern states – especially where housing costs are lower, climates are milder than the northeast or rust belt, & job growth is above the national average. This migration also includes young professionals & retirees who leave California for many reasons. There was only 1% difference between #6 Massachusetts & # 10 Wisconsin so it would not take much to rearrange these bottom five states in the top ten. Of course property taxes are a major player in all of the above ratings. See list below for all 50 states & DC. It is easy to see that New Jersey is 51st & Illinois is 50th in this regard. The rankings are based on the highest effective real-estate tax rate – note that New Jersey's annual taxes based on homes priced @ the state median value are far & away the highest of any state. The effective real-estate tax rate in the list below is determined by dividing the median real-estate tax payment by the median home price in each state. Example – for NJ the $7,601 median real-estate tax payment divided by the $316,400 median home price equals 2.4%, the effective real-estate tax rate. Applying the 2.4% effective real-estate tax rate to the $185,000 median value of a house in the U.S., as of 2016, results in the $4,437 annual tax figure for NJ on a $185K home. The median value of a home was in accordance with the Census Bureau. Every time I present this type of data we see that states that follow high-tax socialist-like government control of its residents, regardless of party affiliation, are @ the top of the out-migration lists. I am still waiting to find a blue state that turns red because more conservatives moved in.